HMS Argyll has successfully conducted the first firings of the Sea Ceptor system, a major milestone for the Royal Navy as it brings its upgraded Type 23 frigates back into service. The Sea Ceptor system, which utilises MBDA’s next-generation Common Anti-air Modular Missile (CAMM), is being fitted to replace the Sea Wolf weapon system on the Type 23 frigates as part of their life-extension programme. Sea Ceptor will provide improved protection for the Royal Navy against anti-ship cruise missiles, aircraft and other highly sophisticated threats. 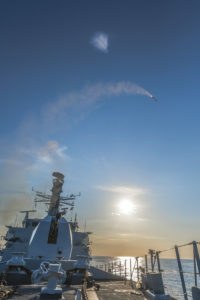 HMS Argyll is the first Type 23 to undergo the life-extension programme, and will conduct further firing trials of the Sea Ceptor system before returning to frontline service. Sea Ceptor not only provides a robust self-defence capability for the host vessel but importantly also a local area air defence competency to defend consort vessels within a maritime task group. Designed and manufactured by MBDA in the UK, Sea Ceptor will also protect the Royal Navy’s future Type 26 Frigates, and as Land Ceptor will replace Rapier in British Army service. The missile uses innovative technologies that provide significant improvements in performance compared with previous generations of missiles. Compared to Sea Wolf, CAMM is faster, has longer range, has a two-way data link, and has a much more advanced seeker, all of which enable the missile to intercept more challenging targets. Traditional air defence systems utilise semi-active radar guidance, meaning they rely on a surface-based fire control radar to illuminate the missile’s target. By using an active radar seeker and datalink on the missile CAMM does not require the dedicated fire control radar on which a semi-active system depends. This not only removes cost and weight from the vessel, it makes integration simpler and means that Sea Ceptor can intercept more targets simultaneously, and across 360 degrees – something a semi-active system cannot. The missile’s clean aerodynamic design provides it with improved performance in the air, while also making it highly compact for installation onboard ship. Moreover Sea Ceptor uses an innovative soft vertical launch system that significantly reduces the impact of a traditional “hot launch” missile on both the ship and the crew. Besides the Royal Navy and the British Army, CAMM is also the modern air defence weapon of choice for a further four nations’ armed services.